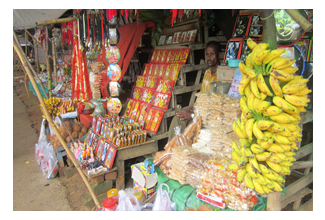 At the entrance gate on both sides of the road towards Panchalingeswar Hill, there are many shops and kiosks where a variety of handicrafts from local traditional artists and craftsmen can be purchased. 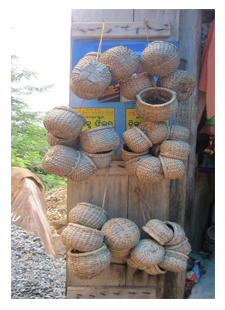 Among these items, you will find cane and bamboo works,filigree, xylography, stone carvings, toys, drawings and hand-painted art on clothes, traditional paintings, and embroidery. 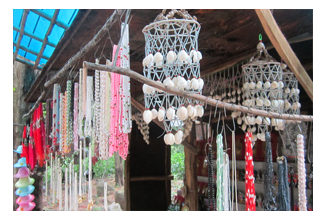 Also available for purchase are different forms of artwork made from conch shells,cowries, and oysters. 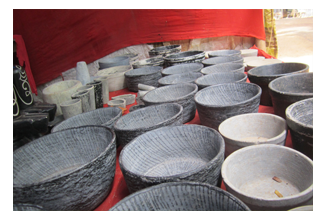 Stone carved bowls, mortar and pestles of black granite stones are always sold here by the local villagers. 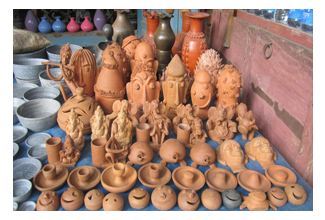 These shops are a place for the connoisseurs of artistic ornaments for women.Visitors are often amazed and absorbed by decorative traditional artistic materials used by these artists.All related to the Hindu traditional art forms used by Indian women, you can find ornaments, such as earrings, bangles (made out of conch shells),bracelets, nose rings of tribal art, waist chains, girdles,tinkling anklets, etc. which can be purchased as a symbol and sweet memory related to this place.